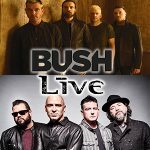 Two iconic rock bands BUSH and Live make their way to Appleton for a summer concert at the ballpark, with special guest Our Lady Peace. The ALTIMATE Tour, celebrating the 25th-anniversary of their landmark albums Sixteen Stone from Bush and Throwing Copper from Live. Formally known as the Fox Cities Stadium. It is a baseball park that is home to the Timber Rattlers in Appleton, WI.